I don't often make posts like this, but I feel an extra compulsion given the status of the two actors who have just left us. Both RICARDO MONTALBAN and PATRICK MCGOOHAN have passed on. Mr. McGoohan on January 13th, and Mr. Montalban today, January 14th. 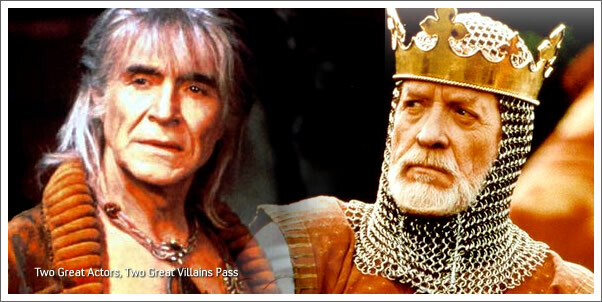 What struck me is that they both played two very memorable film villains of the last 30 years (Khan from Star Trek 2: The Wrath of Khan and King Edward Longshanks in Braveheart). The very next thing to strike me was these two great films were both scored by JAMES HORNER...and remain two of his all-time best efforts. In 2008 we saw just too many all-time greats take their final bows and now 2009 is starting off equally sad. Both actors, who's credits go far beyond the ones mentioned above, will sorely be missed, so in their honor, let's cue up BRAVEHEART and THE WRATH OF KHAN.